Durable yet collapses for storage! When not in use, the retracting handle locks firmly in place, keeping the cart folded. Store it in the closet, garage, storage shed, wherever... its compact size requires less than 2 square feet of floor space. Just release the spring action handle to initiate unfolding and the Foldit Cart is ready to work in less than a minute. Folds easily for convenient storage. Weighs only 33 lbs, but can haul up to 330 lbs. 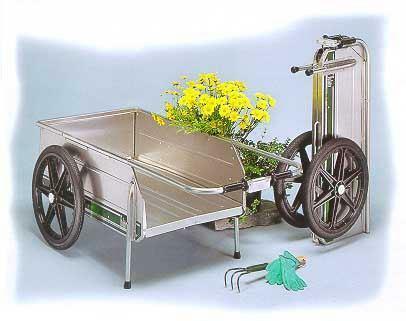 Completely rust and corrosion resistant sturdy all-aluminum construction. Limited 2-Year Warranty. Made with Pride in the USA.